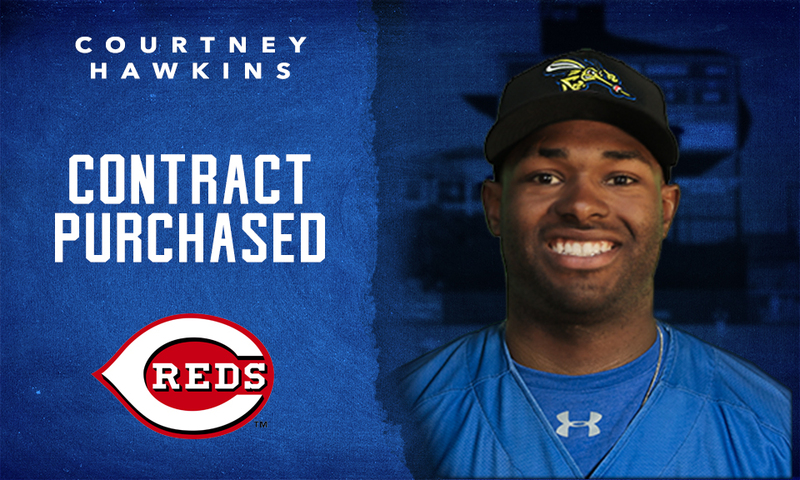 SUGAR LAND, TX— The Sugar Land Skeeters today announced that the contract of outfielder Courtney Hawkins was purchased by the Cincinnati Reds, who assigned him to High-A Daytona. Hawkins, 24, becomes the 11th player from the 2018 Skeeters to have his contract purchased by a Major League Baseball organization and the 13th player to have his contract purchased by a professional baseball organization, both leading the Atlantic League. The 11 contracts purchased from Major League Baseball organizations add to the franchise’s single-season record, surpassing the previous record of nine set in 2013. Since the Skeeters joined the Atlantic League in 2012, the most contracts purchased by Major League Baseball organizations in a single season was 13 from the Somerset Patriots in 2017. Hawkins appeared in 88 games with the Skeeters this season and hit .285/.342/.505 with 54 runs, 17 doubles, 18 home runs, 72 RBIs and 12 stolen bases. He leads the Atlantic League in RBIs, is second in home runs, third in slugging percentage and tied for seventh in runs. Over his last 18 games for the Skeeters, he hit .343 (24-for-70) with 14 runs, four doubles, four home runs and 21 RBIs. He was selected to the 2018 Atlantic League All-Star Game, along with the 2018 Atlantic League Home Run Derby. In his first at-bat with the Skeeters, coming on April 27 at Constellation Field, Hawkins hit an inside-the-park home run, which was the first-ever inside-the-park home run in Constellation Field’s seven-year history and was the second in Skeeters history. The Corpus Christi, Texas native began the 2018 season with Double-A Birmingham before being released by the Chicago White Sox organization on April 18th. The White Sox selected Hawkins with the 13th overall pick of the 2012 MLB Draft out of Mary Carroll High School (Corpus Christi, Texas). He is the highest-drafted player to ever appear with the Skeeters. Prior to the 2013 season, Hawkins was ranked as the No. 55 prospect in baseball, per Baseball America. Hawkins has spent all seven of his seasons at the affiliated level within the White Sox Minor League system, peaking at Double-A, and hit .222/.284/.397 with 79 home runs and 316 RBIs in 568 games. In his senior season at Mary Carroll High School, Hawkins was named the Texas Gatorade High School Player of the Year and bypassed a commitment to the University of Texas prior to signing with the White Sox. The Skeeters return to Constellation Field on Friday, Aug. 10, to begin a seven-game homestand against the Somerset Patriots. First pitch on Friday is set for 7:05 p.m. and a Friday Fireworks show will begin at the end of the game. The first 2,000 fans in attendance on Saturday, Aug. 11, will receive a Tracy McGrady Bobblehead Giveaway courtesy of Assured Flow Solutions, commemorating the Naismith Memorial Basketball Hall-of-Famer’s time with the Skeeters. McGrady is scheduled to throw out the ceremonial first pitch for Saturday’s game and the Skeeters will be raffling off autographed McGrady memorabilia to select fans in attendance. The first 1,000 fans in attendance on Sunday, Aug. 12, will receive a Skeeters Football Giveaway courtesy of Fluor as part of our Football Night. Fans can also enjoy our weekly promotions at Constellation Field, including Dollar Dog, Margarita and Military Monday, Two-Fer Tuesdays, Kids In Free Wednesdays and Thirsty Thursdays.